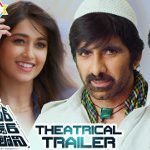 Amar Akbar Anthony Movie Teaser on Mythri Movie Makers ft. Ravi Teja, Ileana D’Cruz, Sunil, and Laya. Directed by Sreenu Vaitla. Music by Thaman S. Produced by Naveen Yerneni, Y. Ravi Shankar and Mohan (CVM) under Mythri Movie Makers banner.